NO TOOLS REQUIRED. QUICK AND EASY TO ASSEMBLE. Put them on any magnetic surface. No drill. No holes. No mess. GREAT FOR PERMANENT OR TEMPORARY USE. Never lose your keys again with magnetic hooks. Great for hanging seasonal decorations. Take them on the road with you for extra hanging and storage solutions. There are many applications for magnetic assemblies, mainly in applications where a strong clamping force is required. Applications include Point of Sale, window dressing, door / cupboard and gate clamps, false ceiling clamps, signs and banners, torque limited seals, jigs and fixtures, lighting holders, marketing and exhibition displays, retrieval magnets, industrial fixings, etc. Can be used anywhere in the home, garage, office or as a travel accessory wherever there is a magnetic surface. Hundreds of uses perfect for kitchen utensils, shed tools, filing cabinets, child safety, mechanics, wiring, washing lines, removing nails/screws, steel doors, hanging lights, decorations, cruises, the refrigerator and so much more! Important to achieve up to 30lbs pull strength the magnet needs to be attached to a horizontal surface - imagine the hook attached to a ceiling with a basket hanging from it. Vertical application the pull force is usually 1/3 weaker. Surface smoothness and steel thickness can also have an impact. INDUSTRIAL GRADE: 30LBS Capacity is based on horizontal application -- reduced by 2/3 if used vertically. STEADY WITHOUT DRILLING: Steady for magnetic surface. High grade neodymium magnet hooks for organization, mounting, decorating and storage. EASY ASSEMBLE: Magnetic hooks are easy to remove, they would be great in any small space to aid storage and easy accessibility, and these magnetic hooks fit in anywhere and serve a purpose that cannot be duplicated. ATTENTION PLEASE: Due to the power magnetism, if you want to use these Magnetic hook on stainless steel refrigerators, we suggest to put a tissue or something else between the magnet and the surface to protect the surface from scratching. LIFETIME GUARANTEE: Our products are extremely high quality and are checked during and after production for quality, your purchase is protected, return at any time and at any point. What are you waiting for, It is time to declutter the space. If you have any questions about this product by DIYMAG, contact us by completing and submitting the form below. If you are looking for a specif part number, please include it with your message. 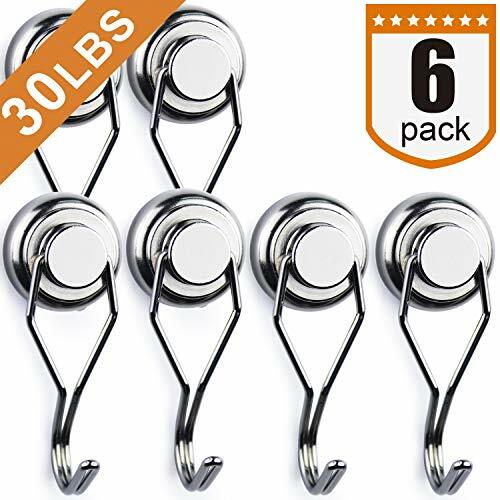 Treats&Smiles Powerful 6 Pack Heavy Duty Neodymium Magnetic Hooks + 4 Magnetic Clips + 3M Non Scratch Stickers - Durable & Strong Hanging Hooks for Indoor/Outdoor Use.